OK conditions around Torquay yesterday morning with a drop in swell back to the 3ft range, average across all other locations. This morning the Surf Coast is poor and a mess while the beaches to the east aren't too bad and surfable for keen surfers. We're now on a downwards regarding swell and surf size, with this trend continuing to play out through the weekend. We'll see conditions improve across the states beaches tomorrow morning though with a N/NE tending N'ly breeze and easing 3ft+ sets on the Mornington Peninsula, 2ft on the Surf Coast swell magnets. Sea breezes don't look to really kick in until mid-afternoon so there should be plenty of time for one or two surfs. Come Sunday the surf will be clean again with a light N'ly wind but the surf only small to tiny. The Mornington Peninsula may see 1-2ft sets if we're lucky. Into the afternoon a surface trough moving in from the west will bring a fresher S'ly change, followed by a strong high and S/SW tending S/SE winds on Monday. A new long-range and inconsistent SW groundswell will fill in through the day, generated by a strong slow moving low south-west of WA the last couple of days, but size wise the Surf Coast isn't likely to get above 2-3ft later in the day and 4-5ft on the Mornington Peninsula. This swell will ease Tuesday ahead of a late increase in mid-period SW swell, peaking Wednesday. This has been downgraded since Wednesday, with the front generating it not looking as good as it was. The front will only produce a small fetch of strong W/SW winds that hardly look to reach gale-force now, resulting in a smaller mid-period SW swell. Size wise the swell is due to peak Wednesday morning to 2-3ft across Surf Coast swell magnets and 3-5ft on the Mornington Peninsula. Coming back to the winds and Tuesday looks poor with fresh SE tending stronger E/SE winds, adding a SE windswell to the mix across the Surf Coast. Both the SE windswell and W/SW swell are due to be a similar size Wednesday morning, easing under a better E/NE-NE wind for the beaches, possibly tending NW later in the day. Either way the beaches should be good most of the day. Longer term we may see a strong polar front push up and towards us late week, generating a windy increase in swell next weekend, but the models diverge on this. So check back here Monday for a clearer idea. Have a great weekend! So are we looking at a virtually flat Sunday morning on the Surf Coast? Sounds OK to me. 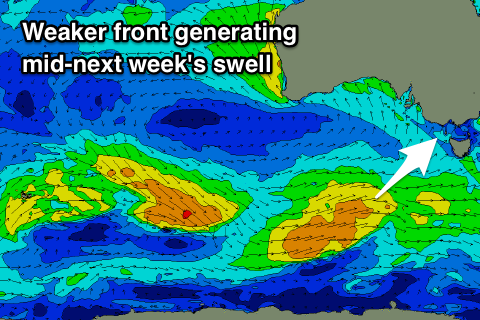 We need to get into the good surf mid week / shithouse on weekends pattern. You would have got some good ones at Winki on Monday and Tuesday morning......surely!? Oh yeh! Craig, looks like another very unseasonal weather pattern is on the way again starting later in the week and continuing for days. How bloody good are the Synoptic charts looking......far out! I love this Extreme Westcoast USA El-Nino thing that's bringing us summer swells, it's blowing my mind. Not related WAG and elso we're not in an El Nino, didn't reach the required parameters and has now passed. Firstly, to be clear Craig, I am by no means questioning your far superior Meteorology skill set and understanding. I really appreciate and think that SN is amazing in the way that everyday nobody's, such as myself, can ask questions and that you provide open dialogue to discuss surfing and related weather phenomenon. Which leads me to this bazaar summer we have had in Victoria. It seams really unusual that we're seeing a continuation of weak High pressure systems that keep falling away sooo quickly, half a day N/E offshore winds and from my perspective, an increase of larger mid to long period ground swells that are not normally associated with this time of year. I am definitely not complaining and have been lucky enough and had the pleasure of enjoying these swells on the reefs but I have decided to do some further reading to try and work out what is going on??. Seams that the U.S forecasting sites e.g NOAA etc. are suggesting mild to moderate El Nino to be effecting the Western U.S Seaboard and Hawaii and maybe will continue into their spring? Southern California, Hawaii etc. have appeared to be on the pump, QLD and basically the eastern side of OZ are having a shocker and Vicco has relatively been pumping (summer standard wise). You posted an explanation of El Nino back in 2015 and if I'm reading it correctly all of the fore mentioned observations seam to match your post. The North Pacific hasn't seen typical El Nino conditions with those strong storms pushing down into Hawaii, they've been sitting a little further away this season. And sometimes El Nino/La Nina's influence on Australia isn't as strong as you would expect. Other factors come into it like the SAM/AAO and Indian Ocean Dipole etc. So there are a lot of different influences at play, especially for Victoria in what as this stage still isn't an El Nino season and the longer it goes like this the more likely it won't happen. The BOM feel it's passed.. "Recent observations and climate model outlooks suggest the immediate risk of El Niño has passed." Why is El Nino a risk? Dryness? Drought? On the flip side is there a 'risk' for La Nina? Flooding? Oh, too think aloud on a keyboard. Yeh sorry NB, normally this is your time of year to shine and enjoy Vicco. It really has been bazaar so far, I know someone's elses feast is another mans famine but that's why I'm soooooo baffled, what is going on with our usual summer pattern? Jump on the ferry mate I'm sure we can share some waves with ya! Ahhh the might Searoad Ferry. The dilemma.. Pay an absurd amount solo or spilt the cost and increase the numbers..
Nice bit of researching WAG! Cheers fella's, sure is a lot of info to try and decipher in your link. I think I'd probably need to go to Uni to figure out what all that means but thanks for providing it anyway. At least I can now keep an eye on how strong both El Nino or La Nina will be moving forward, I've always wanted to go check out the sand points of Mexico, so maybe I'll wait until there is a really strong El Nino in place before looking at a trip. Gday WAG , I beg to differ a little ! Yes we have had some solid ground swells and consistent swells, how ever I can’t remember a summer with so many southerly and Sw on shore winds. N, NE, and easterly winds have been almost non existent. In saying that it’s definetly been odd with a much larger temp differential( almost consistently double normal range) between Melbourne and the coast due to the southerly. This observation could also be due to my work circumstance has changed and I have surfed more onshore junk than in previous years ;) hurry up Autumn! Its not just you brainiac, this summer has been an absolute shocker for southerlies. And when we do get an offshore its all over by early afternoon. Haven't had an evening surf since daylight savings started!